Rory McIlroy hopes to build on a first Irish Open success by emulating his summer of 2014, when he won the Open and US PGA Championship. They were the last of four major titles for the world number three from Northern Ireland, and he is determined to add to that tally in 2016. 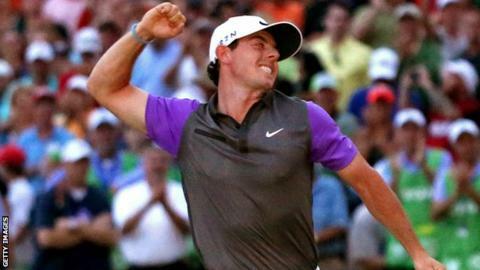 "I feel with this win I can go and replicate my summer in 2014 and win a couple of majors," said McIlroy. "If I don't win a major this summer, I will be very disappointed." The 27-year-old's success at the K Club on Sunday was also his first victory of the season. McIlroy, who has not won any of the past five major tournaments, is focusing on a seven-week period taking in the US Open, Open and US PGA. "You would think that your game isn't going to change too much from the first to the seventh week," he added. "I really want to build up to those seven weeks and make sure my game is in the best possible shape so I've a chance of of winning a major, which would be fantastic, but I want to try to compete in all three."